Voltage Variable Attenuators provide 60 dB attenuation. Available in 6 models covering octave broadband frequencies from 400 MHz to 18 GHz, Voltage Variable Attenuators are suited for use with variable gain amplifiers, power level controls, and feed-forward amplifiers. PIN diode-based devices provide broadband flatness where output level can be adjusted continuously by varying analog voltage on input control line. With CW input power rated up to +23 dBm, each unit is designed into rugged coaxial package to meet MIL-STD-202 environmental conditions. Irvine, CA - Pasternack, a leading provider of RF, microwave and millimeter wave products, introduces an all new line of voltage variable attenuators offering up to 60 dB of attenuation across broad frequencies from 400 MHz to 18 GHz. 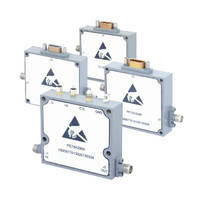 This line of voltage variable attenuators is most commonly deployed in applications such as electronic warfare, instrumentation, point-to-point and point-to-multipoint radios, fiber optic and broadband telecom, microwave radio and VSAT, military radios, radar, ECM, SATCOM and sensors, and R&D.